Do you want to add a featured content slider like Yahoo or ESPN? Many popular sites use featured content slider to showcase their latest noteworthy content. 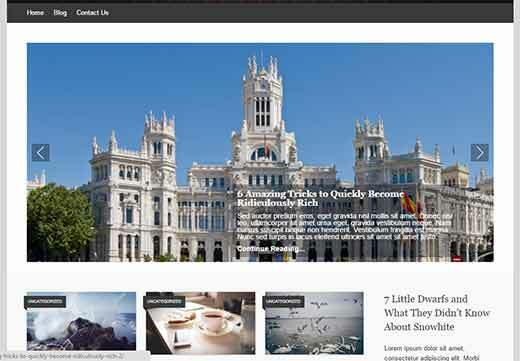 In this article, we will show how to add featured content slider in WordPress. For this tutorial, we will use Soliloquy plugin which is the best WordPress slider plugin on the market. It is super fast, easy to use, and comes with great features like featured content. First you need to install and activate the Soliloquy plugin. Upon activation, you need to visit Soliloquy » Settings and click on the Addons tab. Let’s scroll down to locate the ‘Featured Content Addon’ and click on the install / activate button (Note: Featured Content addon only comes with the Developer license). You may also want to activate the Themes addon which will offer you several pre-made designs for your sliders. Once we have all the addons activated, we’re ready to create our new slider. 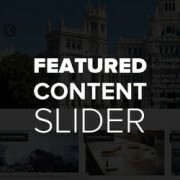 Go to Soliloquy » Add New to create your featured content slider. 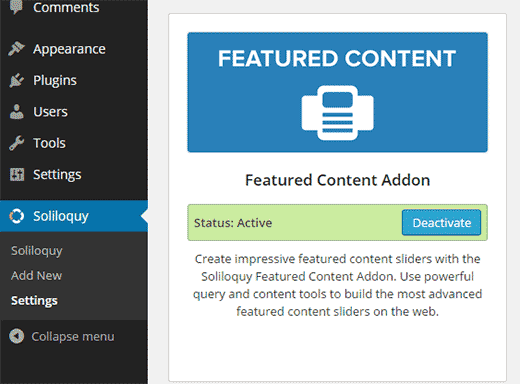 On the add new Soliloquy slider screen, you will notice a new slider type called featured content. When you select it, the slider interface will switch from image uploads to featured content selection. 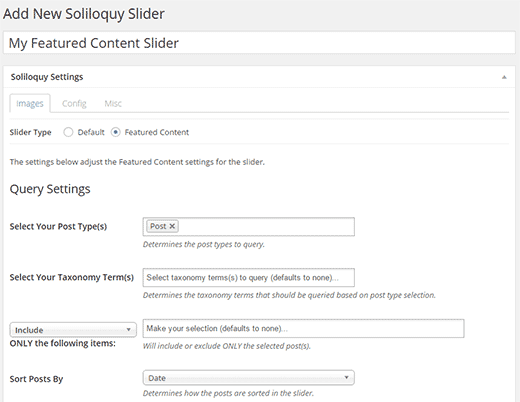 Soliloquy allows you to choose content from all your post types. This means you can select custom post types for your products, testimonials, events, posts, pages etc. The next selection criteria that you can apply is to choose taxonomy. For example, you can add a ‘featured’ tag to all your featured posts and Soliloquy will automatically show all posts that has a featured tag. Soliloquy also allows you to individually select or exclude posts from the slider. Simply start typing the first few words of a post title, and it will start showing matching results below. Apart from these features, you can choose the number of total slides, link settings, featured image, fallback image setting, etc. 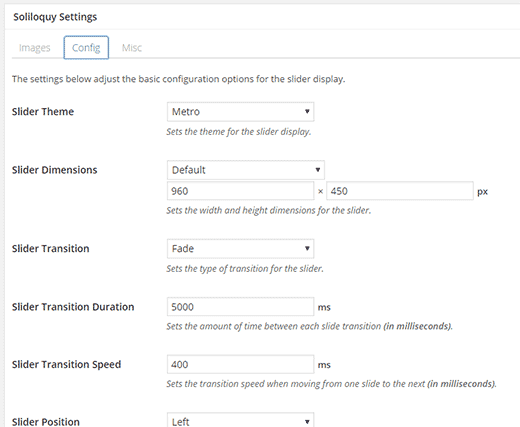 You can switch to the Config tab to fine tune the appearance of your slider. There are a number of options that you can configure to make sure that your slider works the way you want it to. You can always come back to this screen and make the changes you need. Once you are done with the slider, simply press the publish button to make your slider available. Soliloquy offers multiple ways to display the sliders at your desired location. The easiest way is to edit a post/page and simply click on the Add Slider button. Soliloquy provides a shortcode and a template tags to manually add slider on your site. If you want to insert the slider on a static front page, a page or post, then you can use the shortcode. On the other hand, if you want to place the slider by editing a theme file, then you can use the template tag. 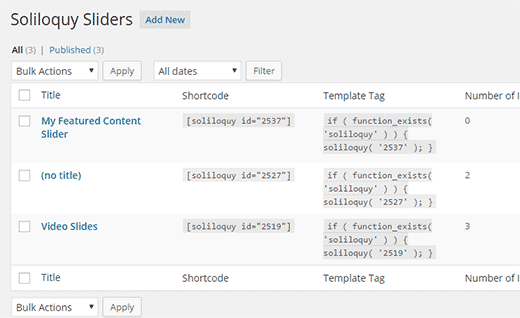 You can find both shortcode and template tag by simply clicking on the Soliloquy icon. It will show you the list of sliders you have created. Next to each slider, you will see the shortcode and template tag. That’s all, we hope this article helped you learn how to add featured content slider to your WordPress site. You may also want to check out our expert list of 20 must have WordPress plugins for 2015. For $99 per year the Soliloquy plugin with the featured content add-on is definitely feature rich for those who want to drop that money on slider. One question I have: Can the Soliloquy featured content add on link to external websites? I’ve been meaning to give Soliloquy a try. That said, isn’t the slider phase on a downward trend?